Aqualand - a water park...with added dolphins! 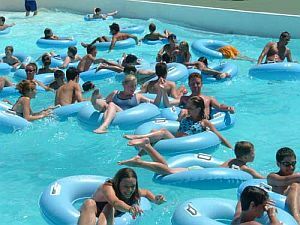 Aqualand - a water park with added dolphins! Aqualand, aka "Octopus Park", situated in Adeje, is a water park with a difference. It has dolphins! 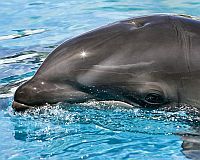 As well as all the top rides, there is a dolphin lake and a show featuring the playful creatures once a day at 3pm. Soft drinks and ice creams are available here. it's cheaper than paying at the gate! To fill the rest of your visit, you can sample the rides. The Tornado A chute deposits you into a bowl where you career round its sides, like a "wall of death" motorcyclist. The Boomerang A steeply descending slide makes an abrupt change of direction, to send you upwards again. The Twister Twin enclosed chutes, intertwining each other. The Mini Park A safe water area for children, featuring the pirate galleon and the castle. The Kamikaze A super-fast slide. The Super Slalom Five slides with lurching bends and slopes. The Rapids Ultimate speed ride, featuring whirlpools. The Congo River An artificial river, where you can indulge in a more relaxing ride on a raft. The Anaconda An enclosed snake-like chute twisting round a central pole. The Crazy Race Four shallow lanes for the faint-hearted. Facilities include one restaurant and one self-service buffet. For those of you in a hurry to return to the rides, there are four fast-food vendors, two snack kiosks and one ice cream parlour. The waterpark also boasts a fine garden area, a solarium and a children's area. For shopping, there is a gift shop, where you can purchase souvenirs of your visit, including the park's own DVD. You'll also find a photo lab, where you can have your snaps processed, selling a complete range of photographic products. The park operates a free bus service several times a day, from Los Cristianos and Las Americas.